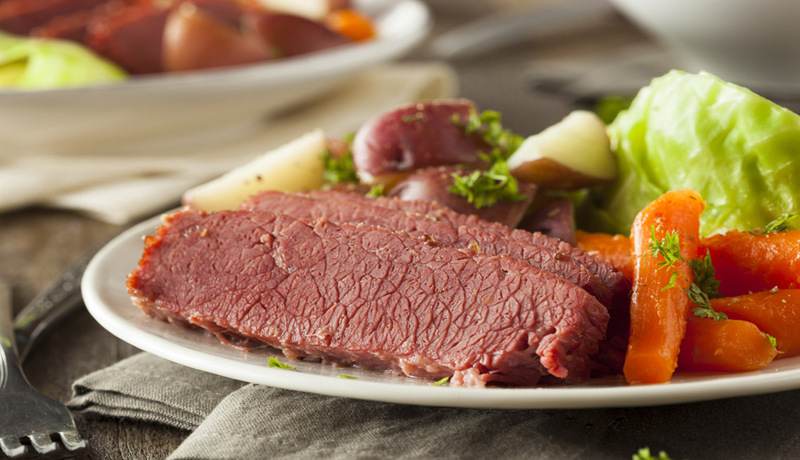 Nothing beats a corned beef and cabbage meal to celebrate St. Patrick’s Day this March. While recipes vary, there are a few unwritten rules you need to follow in order to create the best-corned beef and cabbage dinner to wow your friends and family. 2) Place the brisket into a pot and cover with water, add salt and pepper to taste along with the spice packet, and bring to a boil. Reduce your heat to low and simmer for 45 minutes per pound. 3) Add the potatoes and carrots. Don’t peel the potatoes, simply cut them into halves and add them to the pot. Peel the carrots and make sure they are baby carrot-size; you want an easy piece to bite whole. Let the vegetables stew until they are just tender. 4) Quarter the cabbage and then slice it into long fat strips. Add to the pot and let it cook for 12-15 minutes depending on how crunchy you want it to be. 5) Remove the brisket and let it rest on a cutting board for roughly five minutes. While it’s resting, place the vegetables and cabbage into a different container and add just enough of the cooking water to cover them and let rest. 6) Take a cup of the leftover water and add either 1-cup of beef broth or one beef bouillon cube, a half-teaspoon of peppercorn, and 1 tablespoon of brown sugar. Bring the mix to a boil and then reduce to a simmer. 7) Cut the brisket into long pieces against the grain (if you cut with the grain, corned beef has the unfortunate tendency to literally fall apart) and then place the cuts into the beef broth for up to 20 minutes. 8) To bring the entire dish to completion, place three cuts so they slightly overlap and border the inner edges of the plate. Next, place the potatoes and carrots (two halves of potatoes per serving should be more than ample) in the center. Then use the cabbage strips to ring around the other half of the plate. 9) Use the remaining beef broth with a touch of the vegetable water to lightly soak everything. You want just enough juice on the plate to see and absorb but not so much it looks like soup. 10) Add a touch of horseradish or English mustard to the corned beef, for a little kick.